I recently received an email from an enthusiastic overseas follower of the Unknown Man story who relayed the following information, and followed up with a question. Broadly he was told that at a recent screening of a documentary 'Missing Pieces' at Glenelg, Derek Abbott announced that 'Ronald Francis' was in fact Dr Douglas Buxton Hendrickson. "Given that Dr Hendrickson and his wife, along with their identified close relatives have now died, are you ready to discuss what you know about Dr Hendrickson's car?" Abbot is inclined to be over eager to be recognised as the first to produce new sensational information, so I hope he has checked the sources of the information either gained as a result of his own research or that of others. If he is responsible for putting the above information in the public domain he has 'Jumped the gun' because it is totally incorrect. I have established that the person who owned the car in which the relevant copy of the Rubaiyat was located and his wife are both deceased. Their next of kin have recently given me permission to release identities and details relevant to the 'Unknown Man' investigation. John Freeman, in December, 1948, was a Chemist, and resided with his wife in premises attached to their Chemist shop, at 24A Jetty Road, Glenelg. Their family car, a small Hillman Minx was more often than not parked in Jetty Road, outside their shop/residence. Although I am aware of a couple of Doubting Thomas's I will stand by all the information I have printed in my book 'The Unknown man' (refer Chapter 11 - pages 104 and 105). I will assess and later supply further relevant details gained as a result of my contacts and conversations with John Freeman. 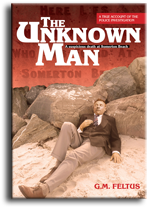 After two printings there are no more copies of my book The Unknown Man available for sale, and there will not be a further printing. As a result, the ‘links’ relevant to the Book Sales facilities on the web site www.theunknownman.com will not be available. The other links, in particular ‘Comments and Queries’ will be maintained and updated with relevant material when necessary. A small number of books may still be available from Dymocks Book Store, Rundle Mall, Adelaide, South Australia, 5000. It has been a massively time consuming task, personally handling, packaging and posting all of the sold books. My original intention was to satisfy a small niche market by self- publishing and producing a book that contained mainly factual information, in a sequential format to satisfy readers interested in the subject. I also wanted my book to be well presented with photographs, maps, diagrams and other reference material in the appropriate sections of the book. As a self-publisher and because of my high expectations in respect to the book presentation I knew I was engaging in an expensive enterprise. I eventually sold books throughout all the States and Territories of Australia, and to twenty three countries throughout the world. These sales exceeded my expectations but the cost of postage was very disappointing. In respect to overseas countries the postage originally commenced at about A$15, and fluctuated to eventually cost A$32 to the USA/Canada, A$42 to the UK/Europe and somewhere in between to the other countries, for each package and posting. When the postage reached A$25 I kept the price at that fee, and subsidised the remainder – making my final subsidy to the USA/Canada being A$7 and the UK/Europe being A$17 for each purchase. Since my book launch in October 2010, I have made the above web site, the email theauthor@theunknownman.com and my Post Box 112, Greenacres, South Australia, 5086, available to book purchasers and people interested in the subject. I have received and sent hundreds of emails and letters, and answered thousands of questions relating to the subject. My book producing effort has been a complex venture that has allowed me to communicate with interesting people throughout the world, and learn some valuable lessons. I would also like to acknowledge the assistance of my son-in-law Steve Skinner who structured and maintained the web sites, and attended to all the PayPal transactions. A number of messages have been received from interested people wanting a photo of the rear cover of the book, and a list of the contents. I received a letter dated 03/06/2014 from The Honourable John Rau Deputy Premier Attorney-General advising that after a number of considerations he had declined to grant consent to Professor Abbott to exhume the remains of the unidentified man. I must say that I, along with a large number of people agree with his decision. This is the second time Derek Abbott has had his application to exhume the body of the 'Unknown Man' declined. I do hope that he finally accepts the decision and devotes his expertise to his chosen career. It has been many months since I have had the time to place 'Comments' on this Link. I have received many emails expressing concerns regarding this, and asking after my health. I did have a health problem some time ago but I am slowly improving and things are almost back to normal. My mother is now 103 years of age and I also need to devote my share of family time to her needs. To date I have posted books to clients in every state of Australia and eighteen overseas countries. As a result I have received hundreds of emails and answered thousands of minor and in-depth questions in my communications with very interesting people. I am slowly catching up on correspondence priorities and I have a number of pending matters to place on this link. In very broad terms considerable speculation has been generated in a number of forums, fairly or otherwise, as to whom is the actual father of the son born to the nurse, even though she and her husband Prestige submitted legal documentation to answer this question. Originally Alf Boxall was nominated as being a father candidate for no reasons other than he met and knew the nurse prior to her becoming pregnant. For a number of concrete facts Alf dropped off the radar as a candidate, much to the relief of his family. Who was the next candidate to fill the vacancy? Enter 'The Unknown Man' alias HC Reynolds. The identity of HC Reynolds was linked to 'The Unknown Man' as a result of a questionable photograph that was recently produced, after it had been located in unusual circumstances. This photograph was compared to the only photograph of 'The Unknown Man' and a facial recognition study of the two produced a number of similarities. When I studied my copy of the HC Reynolds photograph I was not satisfied that he resembled 'The Unknown Man', and I particularly noted and made reference to the fact the person depicted as Reynolds had what appeared to be a squarer chin with a cleft. The response to my cleft chin query suggested that it was a flaw in the photograph and merely a shadow. Perhaps the alleged mole on the face of Reynolds was also a flaw! Also was the alleged mole on the face of 'The Unknown Man' also a flaw or debris resulting from the autopsy? I am unaware of any expert evidence to support or confirm the authenticity of the photograph of HC Reynolds. I was told that this photograph was lifted slightly and writing was revealed underneath. I have no confirmation of this. Despite very intense efforts by capable researchers no evidence has been forthcoming to confirm that this HC Reynolds is a real person. I am not questioning the credentials of those producing the above finding but I do question whether or not the three comparisons are sufficient evidence to prove that 'The Unknown Man' and HC Reynolds are one and the same. I also take into consideration that no two persons have the same fingerprints, and a court will use discretion and may allow evidence of seven identical points to prove identity. In the interim I will maintain my original opinion expressed in my HC Reynolds comments of 20/11/2011, unless there is evidence to the contrary. 'The Unknown Man' has raised considerable debate since he was nominated as a past associate of the nurse and that he is more than likely the father of her son. A study was made of the only photograph showing a right side view of the head of 'The Unknown Man'. Particular attention was directed to the right ear and specific identifying references to structuring and shapes were noted. Although I have not seen it, I believe a photograph of the nurse's son was located and his ears were compared to those of 'The Unknown Man'. The similarities of the two ear comparisons indicated statistically that the likelihood of both persons not being related was very remote. It has also been stated that the missing front teeth of 'The Unknown Man' were not extractions but they never formed due to genetics or a disease. I believe the same or another photograph of the son was studied and this showed missing teeth that may possibly have been caused by the same genetics or disease. I have been told that some of the photographs may have been reversed to make the comparisons. The comparisons do not conclude that both subjects are related but if correct they do make the probability statistically higher. I have not seen the photographs in question and used to make these comparisons so I will not comment further on the subject. The following general comments are but a few selected items that have appeared in the public internet forum presumably to support some of the above mentioned theories or studies. (1) Prestige, the husband of the nurse left the armed services early due to illness, possibly as a result of 'shell shock'; (2) his first wife did not have any children during their marriage; (3) after their divorce his first wife re-married and had a family; (4) Prestige may have been sterile and therefore he was also not the father of a daughter later born to the nurse during their marriage; and (5) his wife, the nurse was promiscuous. I provide the following in respect to these theories/comments: (1) Prestige did not participate in any action zone and his illness was not associated to 'shell shock'; (2) this is not correct and there is evidence to suggest otherwise; (3) this is correct; (4) the daughter is very similar to her father; and (5) not a very nice suggestion. I have viewed a number of photographs of Prestige and his descendants that show similarities to him, in particular the eyes. The attached photographs are included to show some of the similarities and are selectively cut to protect identities. At 2pm on this Saturday the 'History of Science, Ideas and Technology Group' held their May Meeting in the Ira Raymond Exhibition Room, Barr Smith Library, University of Adelaide, where I was a speaker on the subject along with Professor Maciej Henneberg. I commenced my presentation on the background of my involvement and interest in this subject and why it led me to write and publish a book. I then took my presentation in sequence through the known facts of the police investigation and wherever possible included additional information I had obtained. I also made comments and gave my opinion on a number of questionable issues that continually come to the fore. Maciej is Professor of Anthropological and Comparative Anatomy at the University of Adelaide. He gave a very impressive and informative presentation, and described the comparisons he made on a recently produced 1918, US Department of Labor - Seaman's Identification Card, containing a photograph of a person depicted as being HC Reynolds. His presentation displayed a number of identifying facial comparisons between the photograph of HC Reynolds and the only photograph of The Unknown Man. He then presented facts on ear structures and comparisons he made between the ears of The Unknown Man and the son of the nurse. The attentive audience that numbered in excess of one hundred participants were then given the opportunity to ask a variety of well structured questions directed at both of us. After three hours the afternoon tea was a welcome break. Dr Pauline Payne and Bob Major arranged and presided over an enjoyable afternoon. An Adelaide University identity believes the two cases could be connected - the link being a nurse known only as 'Jestyn'. Marshall died as a result of a barbiturate overdose and the Unknown man died of an unknown cause that still remains a mystery. The Unknown Man had his head propped up against the esplanade retaining wall. Marshall had his head propped up on a rock. Both men were dressed smartly. Both men had no form of identification. Marshall was found dead at Mosman beach, Sydney, with a copy of the Rubaiyat. Three years later the body of the Unknown Man was found on Somerton Beach, Adelaide. He had a piece of paper torn from a Rubaiyat in his possession. Some months later a copy of the Rubaiyat was found discarded in a vehicle in a nearby suburb. The book was first noticed in the vehicle shortly after the death of the Unknown Man. It was also linked to the torn piece of paper found in the clothing the Unknown Man was wearing. The University identity believed it was highly likely Mr Marshall, 34, knew the nurse. "We have no hard paper trail linking Jestyn to Marshall, but the circumstantial evidence is mounting ..." He also said he knew the full identity of the nurse - who died in 2007 - but would not reveal her name out of respect to surviving family members. In my opinion the article was well written and I respect and admire the work of good researchers. On the information supplied I do believe the linking of the nurse to Marshall, and the two death cases are somewhat tenuous and would be questionable on a probability rating. I also applaud the respect shown to the family by not revealing the identity of the nurse. It is a pity that the same respect was not considered in the past. I am aware of, and I have been privy to, communications with a small group of dedicated researchers (known as 'The Inner Sanctum') from Australia and overseas who have produced some interesting results relating to the Unknown Man subject. Using high definition magnification and filtering processes on the copy of the 'code' they have produced images that question the theory they were caused by pareidolia. Exceptional follow up research on their findings by delegated members within the group have also produced interesting information. I will follow their progress with interest. On 20 Nov 2011, I submitted - Comments by Gerry re H. C. Reynolds article. In that update I stated the following; "It soon became obvious that a number of people were 'tripping over each other' to obtain information about Reynolds so I removed myself from that line of inquiry." I have received queries from a number of interested people in overseas countries who were somewhat confused by the term I used. Perhaps I should have said that in all areas of project management it is appropriate that tasks are delegated to an individual or a select group to prevent duplication and confusion. I was fully aware that groups of people far better qualified and experienced in research than me were already obtaining quality information on the subject. I therefore removed myself from doing the same line of research to prevent duplication. My apologies and I hope this clarifies any confusion - no more Aussie slang. Postal costs are continually rising and although postage to the USA and Canada was cheaper than Europe and other overseas countries it has now increased a further A$9.00(Surcharge) to A$33.00. This cost is now comparable to postage rates throughout the world. For your information it costs me A$1.30 for a padded envelope plus the postage making a total of A$34.30. For some time I have been subsidising these costs to varying degrees and future postage and packaging to all overseas countries will therefore be a uniform $A25.00. I have been advised that the rise in postage fees has been caused by the requirement that all overseas packages must be x-rayed. Postage within Australia will remain at $7.00. I have received many queries in respect to my book sales. As a self publisher I have received valuable assistance from a number of bookshop outlets in South Australia to promote and sell my book. My web site sales to intrastate, interstate and overseas purchasers have been beyond my expectations. I have had exceptional sales to the USA, Canada, the UK and Germany and other sales to South Africa, Japan, Spain and Burma. I have received hundreds of letters and emails from purchasers who were pleased with the book generally and the content specifically. I have also supplied further details to a very large number of readers requesting additional information on the subject. The project has given me the opportunity to communicate with a large number of interesting people throughout the world. A lengthy article was recently printed in the Sunday Mail relating to a comparison of two photographs by Professor Maciej Henneberg. One of the photographs depicted a male person on a U.S. Department of Labour Seaman's Identification Card, signed on 28 Feb 1918 in the name of HC Reynolds, 18 years of age, British nationality. The photograph of Reynolds was compared to the police photograph of the unknown man taken shortly after the autopsy. Prof Henneberg made a comparison of the facial features in both photographs cementing his opinion that it was more than likely the same man. It is necessary to read the complete article to analyse the comparison by Prof. Henneberg. The article has appeared on a number of web sites throughout the world. A number of interested people have contacted me personally, via telephone contact and emails in respect to this article and asked for my comments. Basically I have supplied the following details to them. In early February 2011, I received a letter from the woman (not identified in the article) containing comprehensive detail, a photograph of HC Reynolds and the circumstances under which it was found. This was followed up by a number of telephone conversations. I had no doubt about the authenticity of the information supplied to me. I became aware that the same photograph and details had been forwarded to a number of other interested parties. I was also advised that Professor Henneberg had advised her: "The similarity, however is substantial and in my opinion warrants further investigation." I wrote in my reply inter alia, "I have no alternative but to accept his (Prof Henneberg) learned opinion. As I explained to you during our conversation I don't see any resemblance to the 'Unknown Man'. After studying his photograph for years (the Unknown Man) there is nothing in the face of Reynolds that 'jumps out' at me that is similarï¿½ Also Reynolds has a square chin with what appears to be a cleft or dimple, whereas the 'Unknown Man' has a rounded chin. My opinion, and I will stand corrected if I am wrong." I provided details of a record relating to H Reynolds, Able Seaman, on 'Empress of Asia', Suez Canal 1941, and advised that I could not locate any details to authenticate the U.S. Identity Card. It soon became obvious that a number of people were 'tripping over each other' to obtain information about Reynolds so I removed myself from that line of inquiry. I have not seen an official statement from Prof Henneberg. I have every respect for Prof Henneberg and accept his qualifications. If he is positive that Reynolds is identical to the 'Unknown Man' I will reconsider my views on the subject. A lengthy article was recently printed in the Sunday Mail in respect to an application submitted to the Attorney General by Derek Abbott to exhume the body of 'The Unknown Man'. In a statement to the Sunday Mail, Mr Rau said: "Given that I have not received an application from the police or the Coroner, I'm not convinced that I have been presented with sufficient reasons to approve the exhumation of the remains. "Exhumation is a step which I would only approve in very compelling circumstances. The application before me offers only the possibility that DNA could be used to provide police with further leads to investigate the unknown man's identity. "There needs to be public interest reasons that go well beyond public curiosity or broad scientific interest for the Attorney-General to approve an exhumation." The author has recently received documentation from the Attorney General's Office advising that an application from another party to exhume the body of the Unknown Man has been refused. May he rest in peace. A Victorian Gentleman (name excluded) has maintained an interest in codes over the years. He has applied the interpretations of single and double letters produced by hoisted flags and pennants using the International Code of Signalling, and compared them to single or double letters of the Rubaiyat 'code'. The following interpretations are produced by using some of the single and double letters within the Rubaiyat 'code' as random examples of his theory. 'C' = Yes or, Affirmative, 'D' = No or, Negative, 'GO' = You are within gunshot, or, You are within reach of guns (or, of batteries), 'AB' = Abandon the vessel as fast as possible, 'BA' = Can damage be repaired at sea? 'BD' = Damage can be put to rights inï¿½hours, 'ML' = Stop her, 'LI' = Go ahead full steam, 'IA' = Have received the following communication (or, instructions) from your owner (or, agents), 'IM' = Will you telegraph to ï¿½ (ship or person named) the intelligence I am about to communicate?, 'TG' = Your orders are at ï¿½(or will be at ï¿½ ), etc, etc. His interesting and unique theory has been included to share with others. A couple of callers have made mention that there are no spare pairs of socks listed as items found in possession of The Unknown Man. On page 30 of my book, under heading 'Post-war years', last sentence of first paragraph I wrote; "All across the country there were shortages of almost every consumer item, including things as basic as a pair of socks." I did not research the reason for this but I made mention of this fact because I did note there were no socks listed amongst his possessions. Perhaps it may have been more appropriate if I mentioned this fact under the listed items on page 155. I am aware there has been healthy debate in respect to numbers, letters and images being revealed on numerous items, in particular a copy of the 'Code' shown on page 106 of my book. I also make reference to a photograph of D/Sgt. Leane and Det. Brown holding items of clothing on page 61 of my book. I obtained this photograph from what I believe is a copy taken from the negative of the original newspaper photograph. On the left of the photograph and under the flashlight reflection on the open lid of the suitcase are clear numbers. Under various magnifications there are numerous numbers throughout the photograph and if a little imagination is applied other images appear on the suitcase lid and the coat pocket of D/Sgt. Leane, just above the camera flash. I also noted what appeared to be numbers, possibly written in indian ink on the bottom of the trousers pocket shown in the far right of the photograph. I have also viewed other photographs and newspaper articles where similar images appear under magnification. I have reservations as to the causes of these appearances but I am not learned enough to comment further. My comments are not meant to dissuade interested parties from continuing their analysis of the subject. I have been advised there is information on a facebook page that suggests a ridge on the forehead of the Unknown Man, seen in a photograph and the bust, may be an abnormality. This ridge was caused as a result of the autopsy examination and where stitches were inserted at the completion. I will not go into the gory details as to why an incision was made in that position. The following is a unique and original theory in respect to the 'code'. This theory says that the code is composed of random letters, concealing a number of Roman numeral digits. These digits spell out a 4 digit number, which is consistent with a South Australian 'phone number in 1948. The area code for Glenelg was X at the time, and this explains the X floating above the 3rd line of the code. Hiding Roman numerals has been done for a long time, usually as a Chronogram to hide the year of the item. The idea appeals to the Occam's Razor concept of simplicity. It is effective and simple for both the encoder and decoder. Furthermore, study reveals that the chances of a string of 44 digits revealing a valid Roman numeral are about 10% likelihood. The original police investigation was titled the 'Somerton File'. For some reason references have since been made to the 'Somerton Man' and the 'Tamam Shud Case'. I titled my book 'The Unknown Man' because that is the inscription on his headstone. All responses to the front and rear cover of the book have been complimentary. 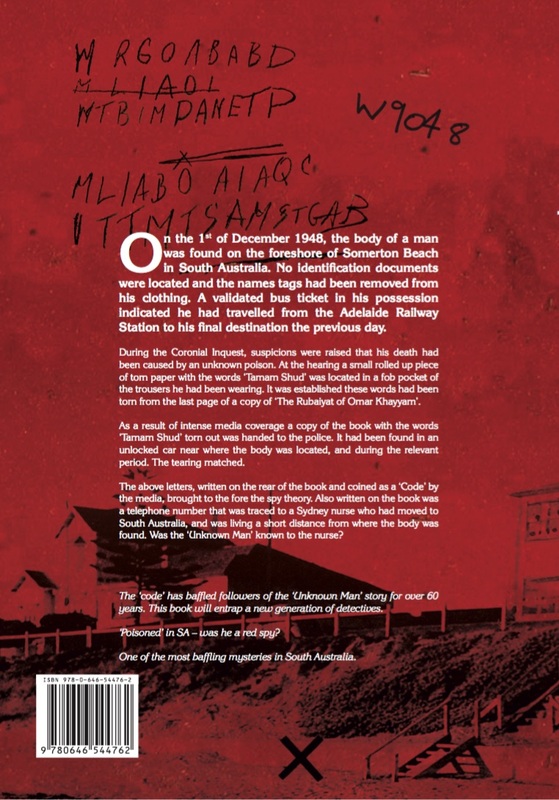 The front cover was designed to show that death occurred on a beach, and the deceased was wearing a particular style and colour of attire. It also directs the eye of the observer to the face of the 'Unknown Man' set within an array of the colourful rocks that have since replaced the original seawall. I originally placed the wording of his headstone on the rock near his right shoulder but excluded it to prevent clutter. The 'Code' and a telephone number (fictitious) was placed on the rear cover of the book because I am of the opinion they were found on (not in) the rear of the copy of the 'Rubaiyat'. The 'Code was placed on the rear to allow purchasers to easily copy it for 'doodling' purposes without damaging the interior of the book. I have received a large number of queries and comments via emails, letters and personal contact from well meaning people. To date I have responded to all queries and comments apart from a few that are pending. The queries have ranged from minor to complex, and a few appear to be straight out of 'Star Wars'. All comments have been favourably to the cover, the structuring, the sequence and contents of the book. Readers have gone to complex in-depth analysis of the circumstances, and I am appreciative of their efforts to produce a range of interpretations, views and opinions. Most of the minor queries I have been able to answer by making references to various pages within the book. The 'Code' has certainly captured the attention and imagination of a large number of readers, and I apologise to those who have lost a considerable amount of sleep in the process of attempting to solve it. As a matter of principle I will not be revealing the identity of the nurse and my reasoning is contained in the second paragraph of page 12 of the book. I cannot find a logical reason how by revealing her identity it would assist readers to further their comprehension of the known facts. If others choose to take an alternative course they can suffer the consequences. My inquiries with security agencies have proved negative in respect to Boxall, the nurse and her husband. I am aware that in the photograph on page 32 there is a double-decker bus parked in front of the Adelaide Railway Station. This is where the bus returning from the Glenelg area stopped. I am also aware that in the photograph on page 37 there is a drain outlet in the seawall to the right of the steps. I have no knowledge as to the purpose of the outlet but I presume it was stormwater as apposed to sewerage. I am unaware if rotting seaweed emits any toxic gases. These queries were raised as a result of the mysterious deaths of Bogle and Chandler some years ago, and recent findings as to their cause of death. The 'dot' in the centre of the map shown on page 38 indicates Jetty Road and not where a vehicle was parked. Recently, in a 'facebook' entry an identical map was produced with reference positions indicated by 'arrows', that caused some confusion. That map was extracted from a confidential copy of my original draft manuscript without my permission. Thank you for offers but I do not wish to join or contribute to any 'facebook' sites. I have serious restrictions in respect to my time management, and I have strong reservations about the management, structuring, confidentiality and credibility of some 'facebook' sites and the like. I respect the choice of those who do not share my views.